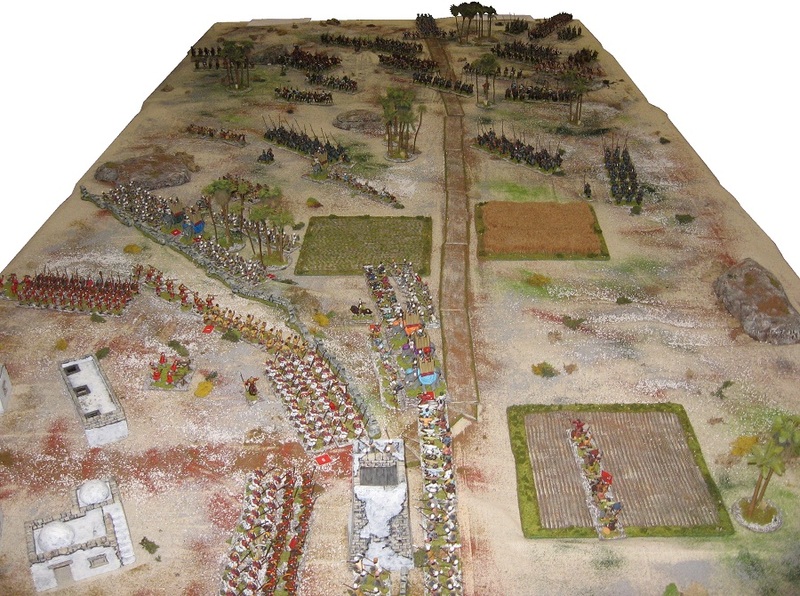 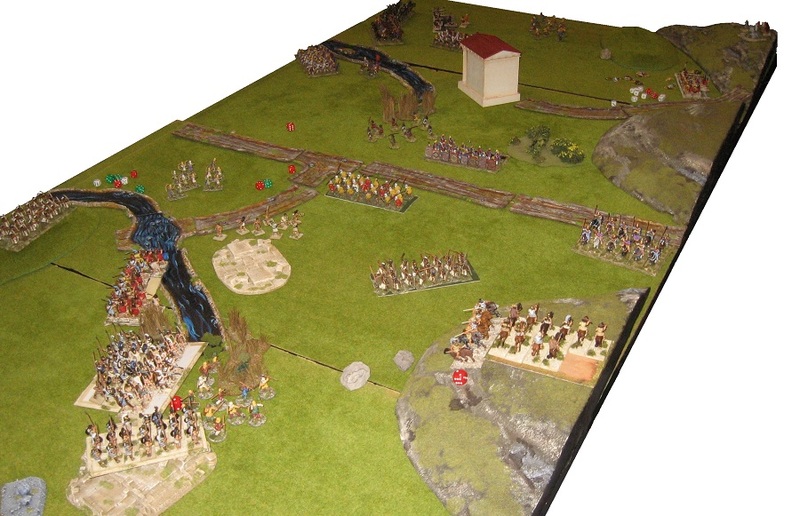 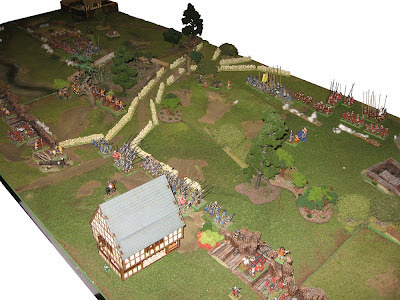 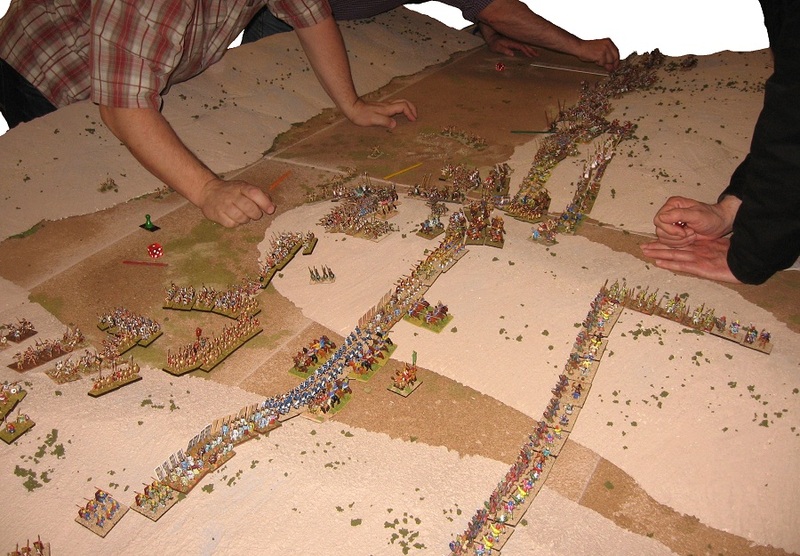 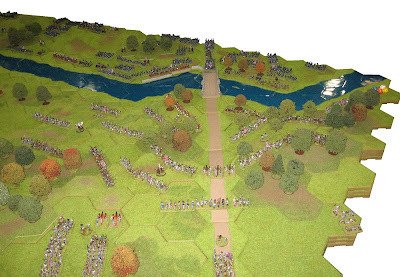 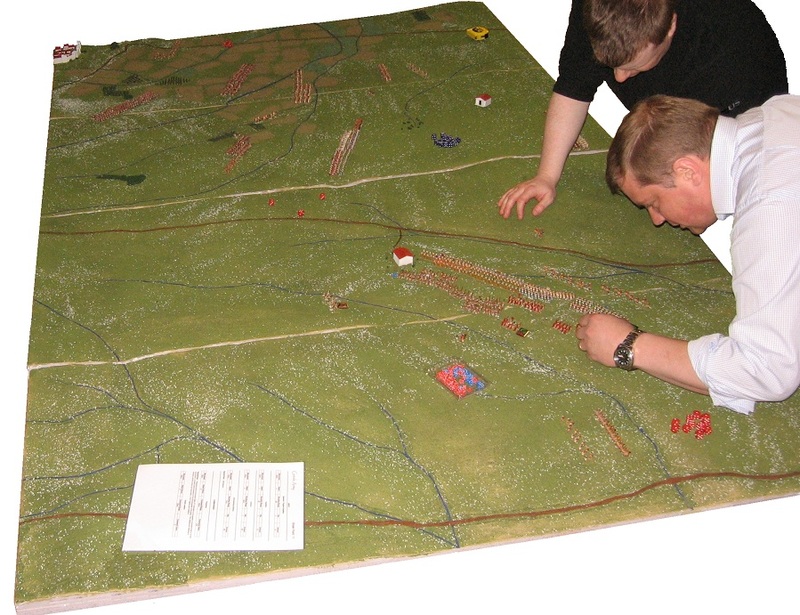 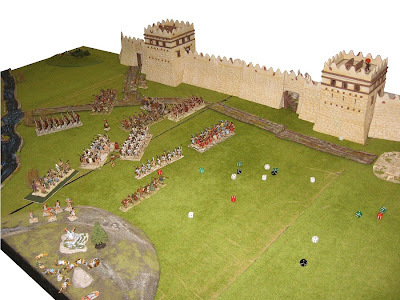 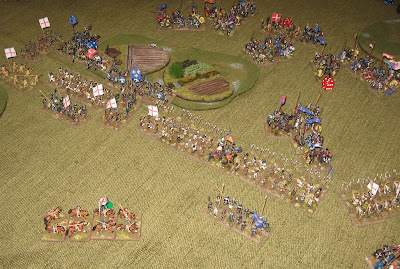 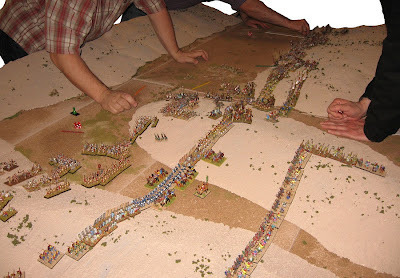 ... the Macedonian defeat of the Greek Coalition, reconstructed by Philip Sabin's team of Eric Cruttenden and Alan Waller, and run by Phil using his Lost Battles system. It was, of course, Alexander's first appearance on the world stage, leading the noble cavalry in his father's army. 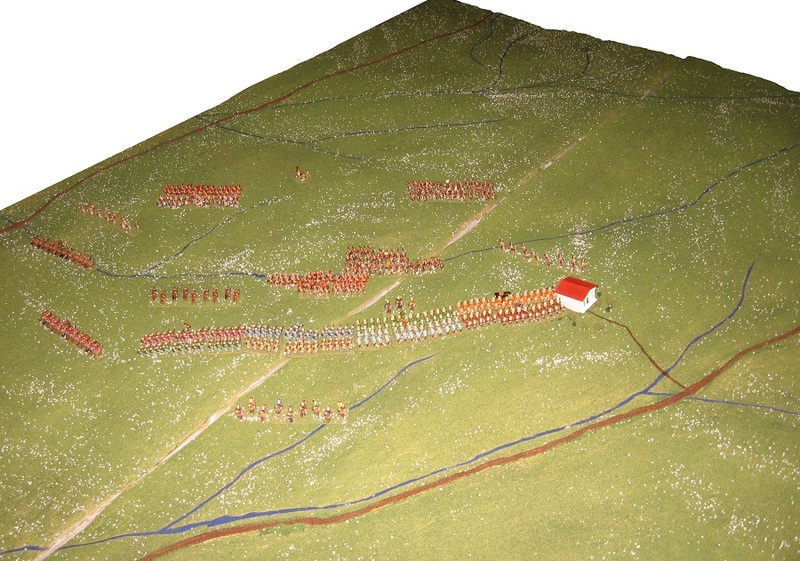 We know quite a lot about this battle - but by no means everything ... so it is an ideal battle to set up historically and explore the what ifs. The battle ran through quite smoothly, and as is usual with Lost Battles, was able to be played several times during the day. 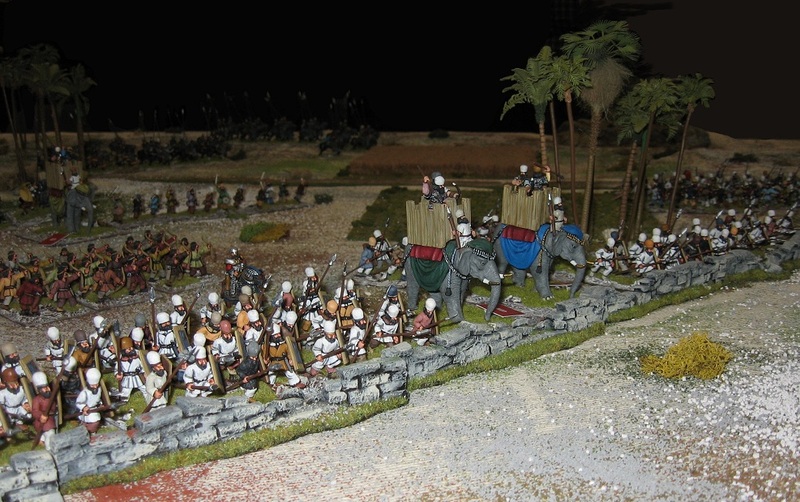 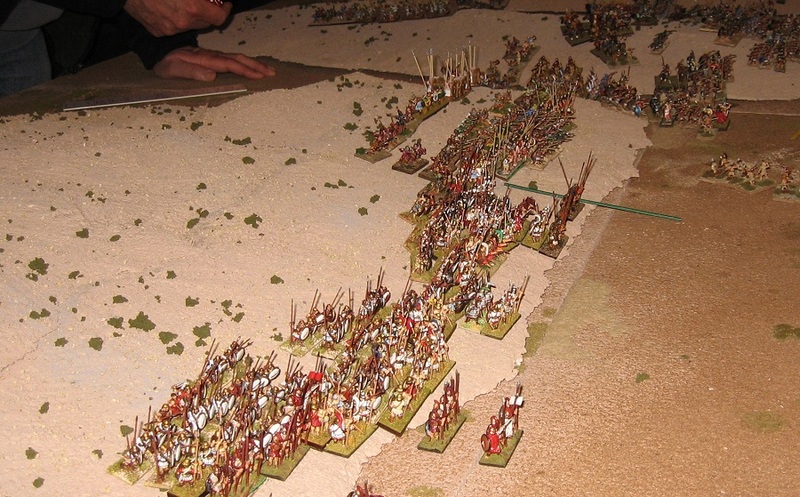 Alexander rode to glory at the head of the Companion cavalry but the Theban Sacred Band proved very tough opponents and drove their way across the table. 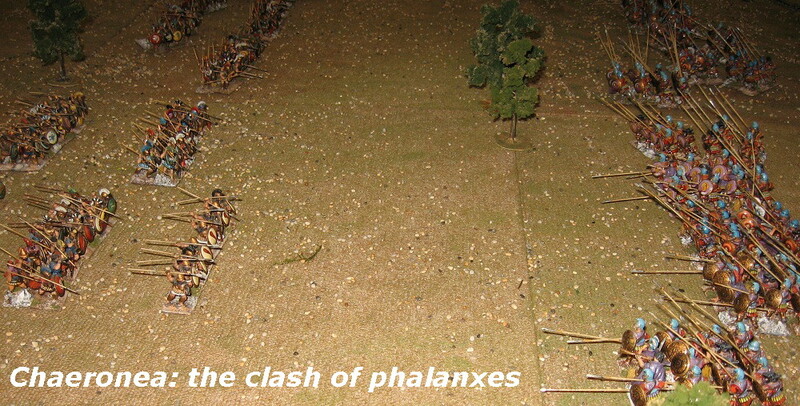 And by no means a one-sided encounter if you take account of the handicap the Macedonians enjoy as the more powerful of the armies. 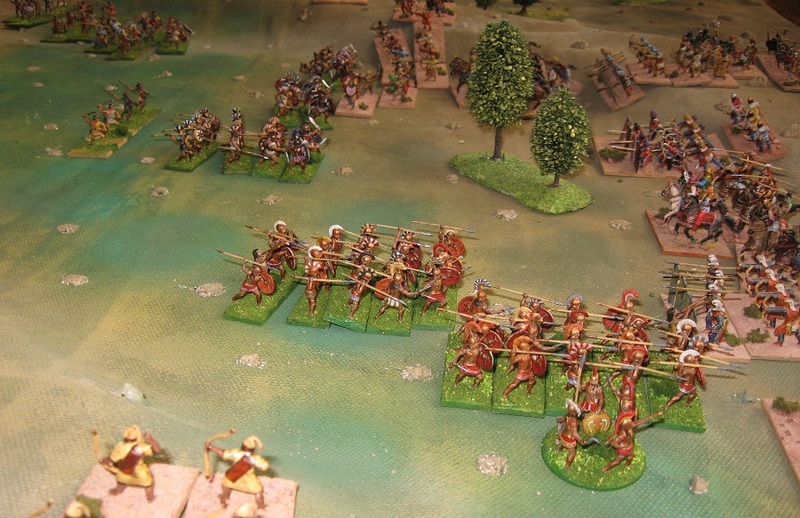 This year was a good year for ancients enthusiasts with a wide range of games across both the more popular scales. 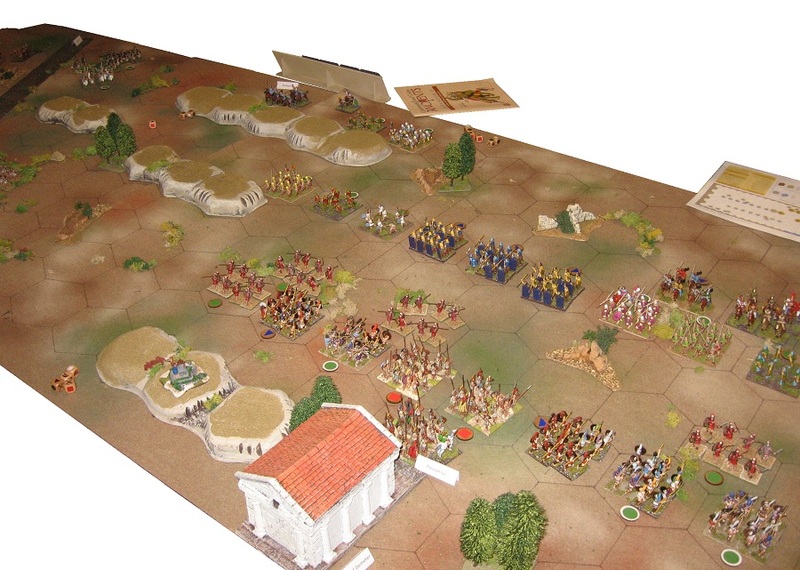 I can well remember some years back at Olympia when the SoA game was the only pukka ancients game in the building. 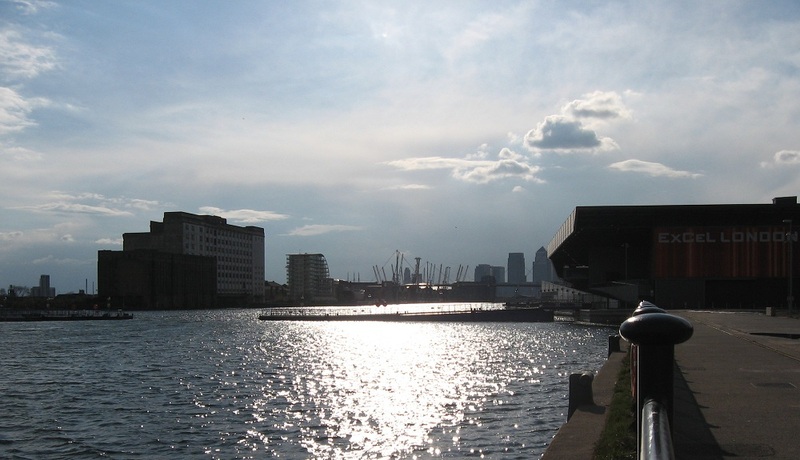 Not so today. Hail Caesar, HOTT, Field of Glory, Warlord, War & Conquest, as well as Lost Battles: there's diversity as well as quantity, these days. 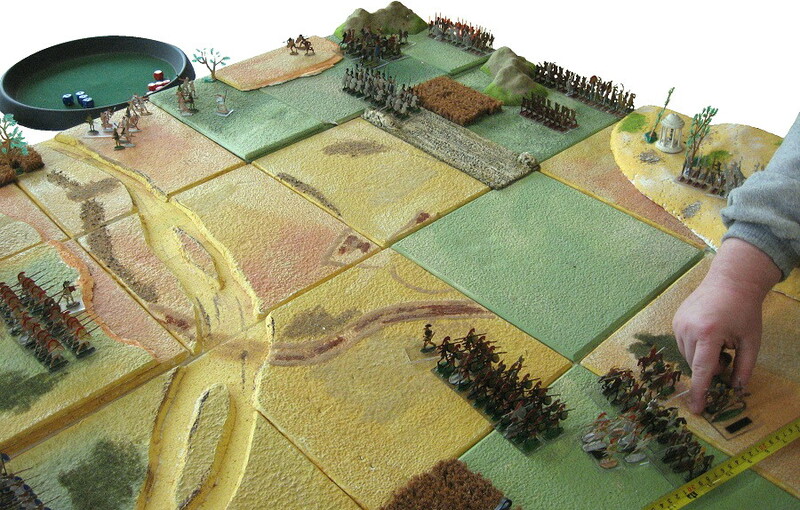 Some nice 'massed' 28mm, and quite an effective use of 'cloth + scatter' type terrain. I was very pleased to see Donnington/Ancient and Modern's 100 Years War FoG game: this is a very popular, almost ubiquitous, tournament game - but rarely does it get demonstrated and profiled at shows. 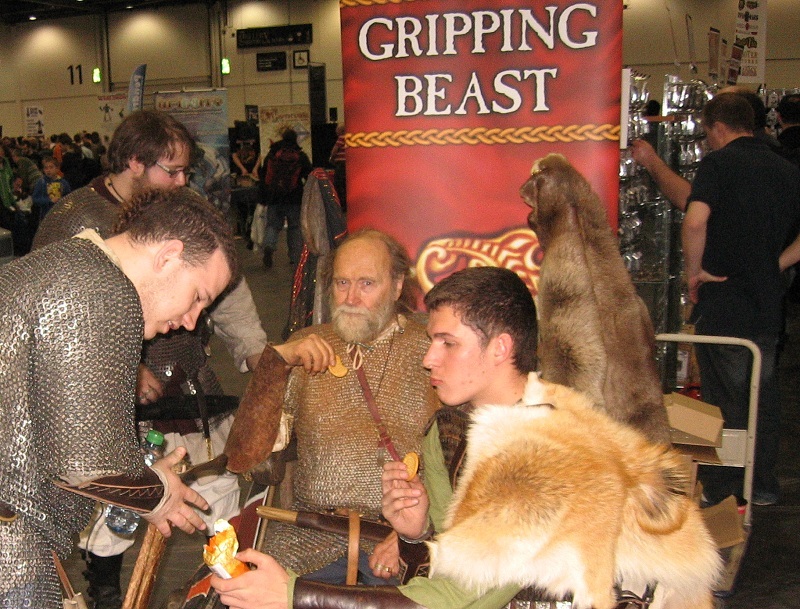 For good or ill, games should always meet the wider audience. Another splendid Lance & Longbow Society game (remember Verneuil?) 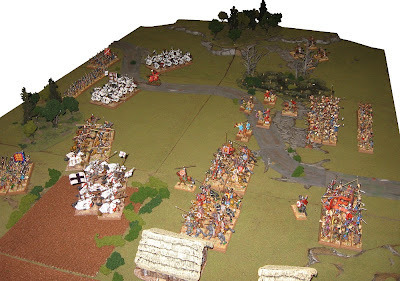 - with an emphasis on the figures rather than the simple layout. Although there are some oddities in the cast, South East Essex's HOTT Kingdoms in the Dust is basically an ancients game, and I have seen it giving a lot of pleasure across a number of southern shows. 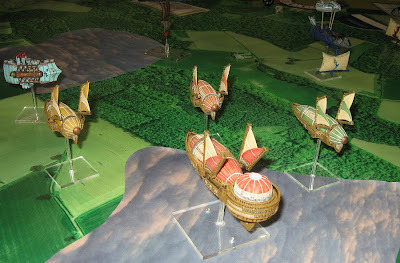 I hope they had a good day at Salute. 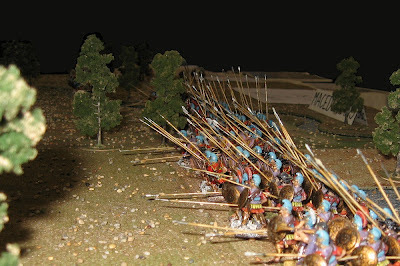 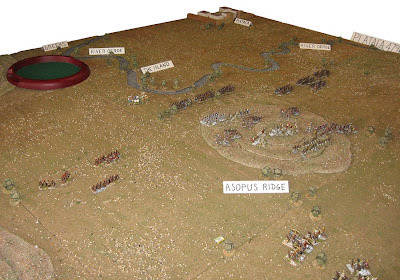 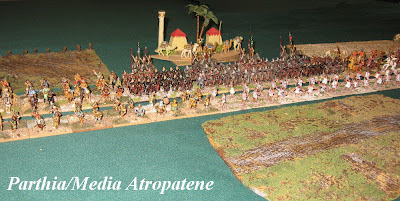 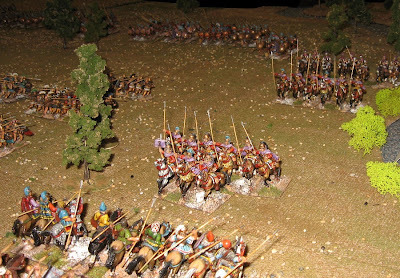 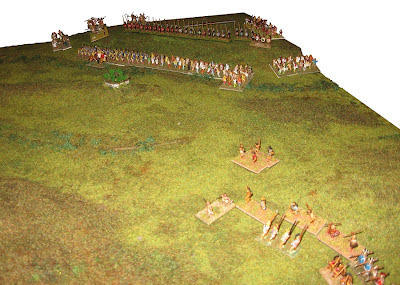 Society member Rob Broom and his Bristol chums were also there with the Peloponessian War battle at Amphipolis (422BC), notable for the mortal wounding of the much-quoted commander Brasidas. 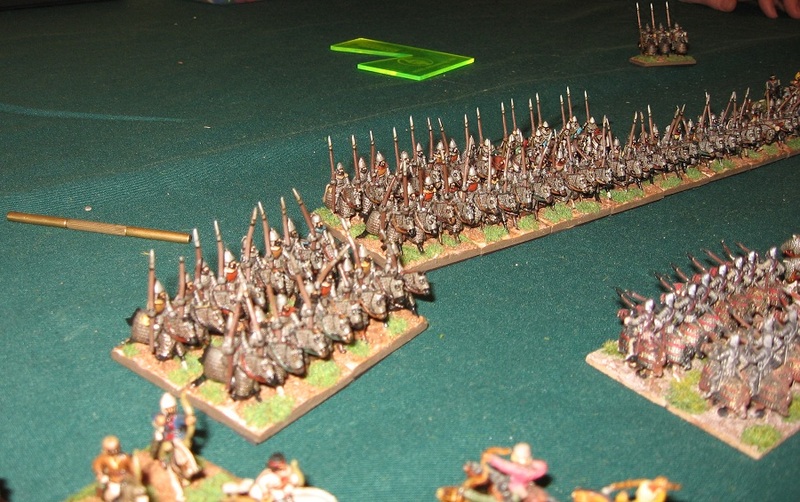 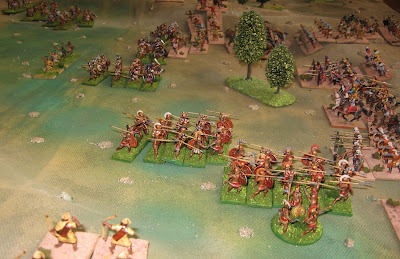 The Pike & Shotte game going with the Warlord Games rules had a very clever flashing lights effect in the volleys markers which worked quite well - and they tell me the game has got better too. 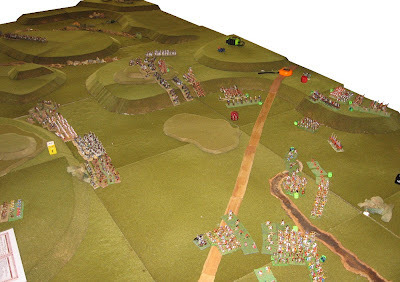 And, having clambered around those impossible Confederate positions, I never like to miss picturing Burnside's bridge when Antietam is reconstructed ..
... this time in a very pleasing arrangement using Kallistra's terrain tiling system and (12mm) figures range. ... and there were some other gems. 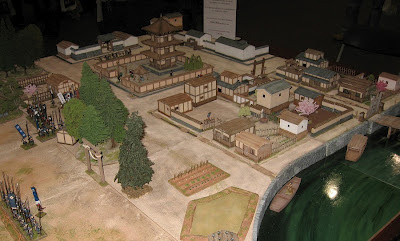 A great deal to look at, then, even if like me, shopping is not a big part of your agenda and, being a historical player, a big chunk of the exhibits are of not of interest. 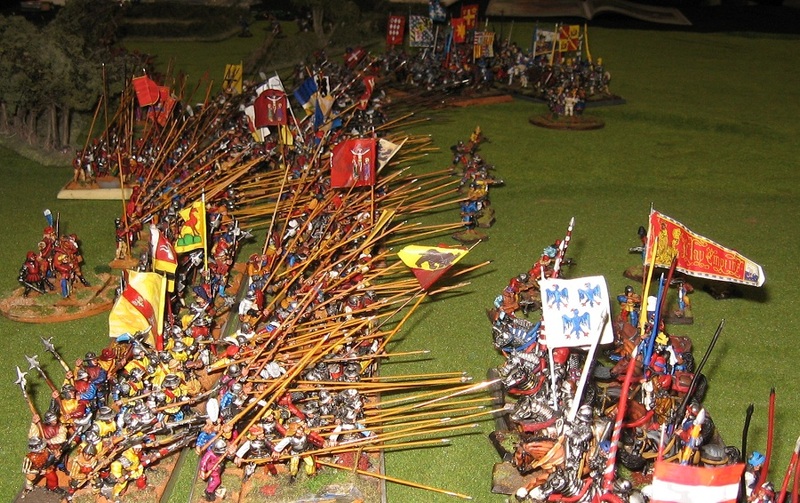 Very well done, Warlords. 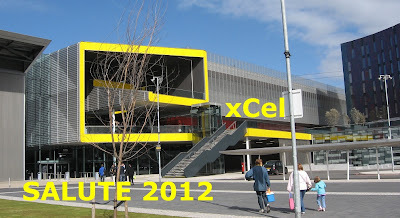 An excellent day out, and a pleasure to meet and greet and chat to people. Thanks to those of you who called by the Society stand to say hello. 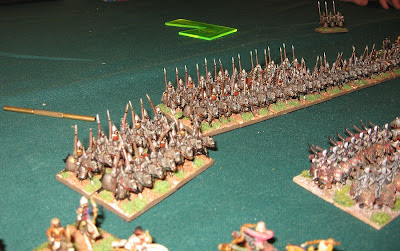 Thanks to the Warlords for making us welcome. Next outing for the shows team: Campaign in Milton Keynes - it's in a shopping centre, so you can bring the whole family. 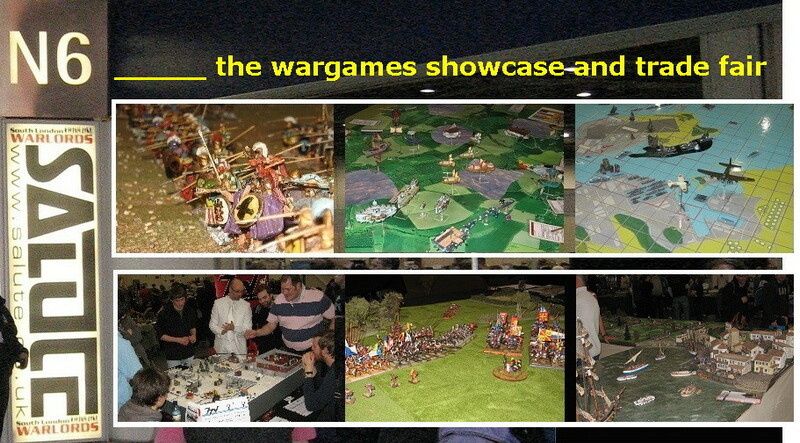 We will have a participation version of the new game 'Call it Qids' and another chance to try DBA V3 with my classic flats collection. 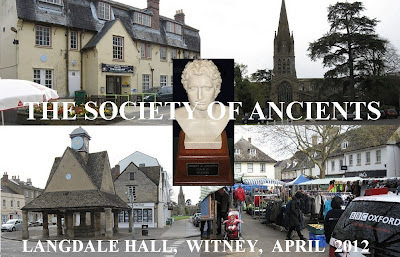 Again a one-off event, this years Doubles Masters went to the Oxfordshire market town of Witney ... very smart, in these days where the local MP is Prime Minister of the country (it was a little less polished in the early 60's when I was a village boy just down the road). As last year, the masters was contested in Field of Glory and DBMM, and some spare space was allocated to an associated FoG-R event. 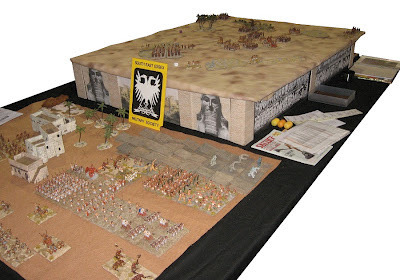 The DBMM was 500 points, themed 500BC to 476AD. 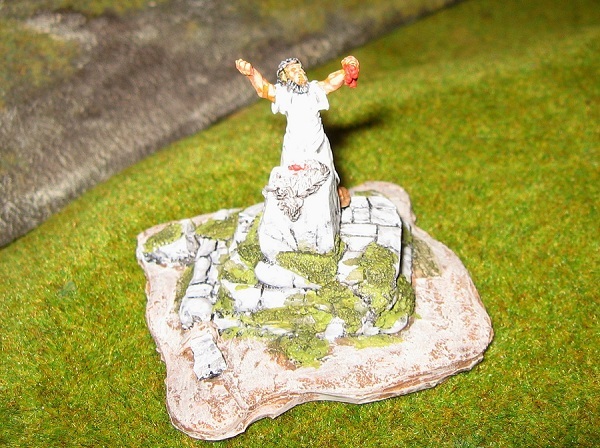 The FoG was 900 points themed 450BC to 200BC. 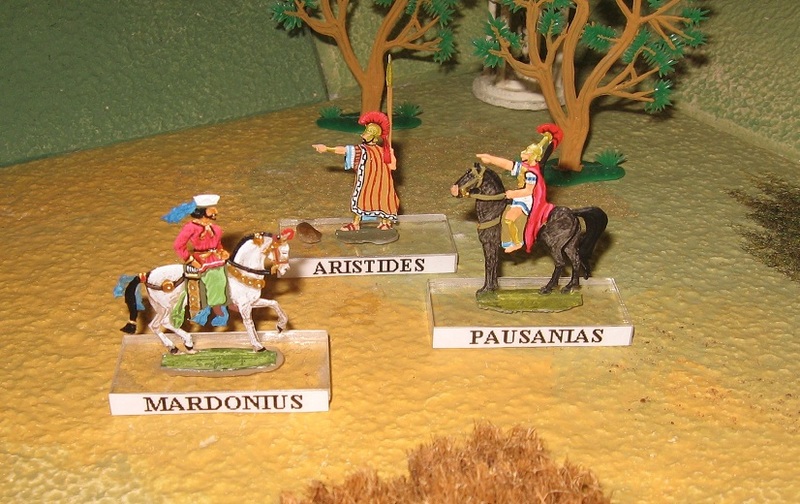 Chris and I had struggled to find a suitable (easy to use and reasonably authentic) army within the highly restrictive period theme - in the end we realised that we could put out a reasonably attractive Parthian army which complied with the time thread. 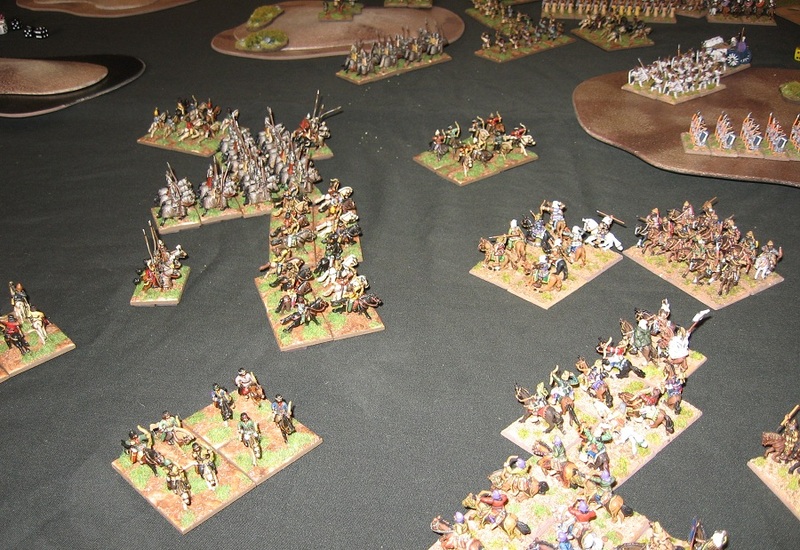 We had a very pleasant weekend - although it started fairly slowly with a bye in the first round (despite the organisers' best efforts to get an evened-up entry) . Our second game was against a Warring States Han Chinese army, and on Sunday morning we faced eventual winners Nik and Dave who also had Parthians. 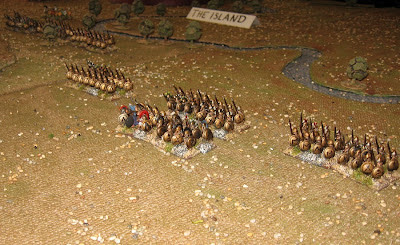 It isn't unusual for we four to meet up on a Sunday morning - indeed we faced Nik with the same army but a different partner at Burton with out Libyans (we won that one) - but over the years they have had the edge on us ... they often go on to do well in the final placing and we generally achieve an undemonstrative mid-table. 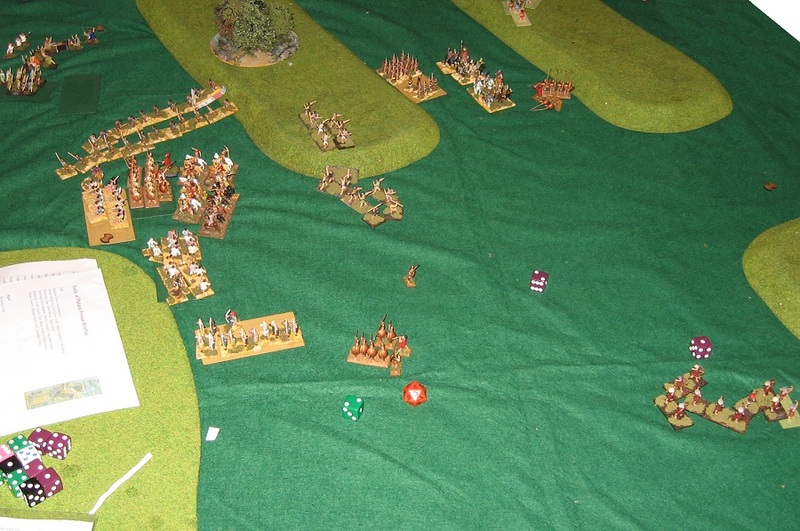 This event was not unusual and after what felt like a fairly even game in which we one or two weaknesses the attrition points escalated in the last couple of turns (our army broke on the last phase of the last turn). 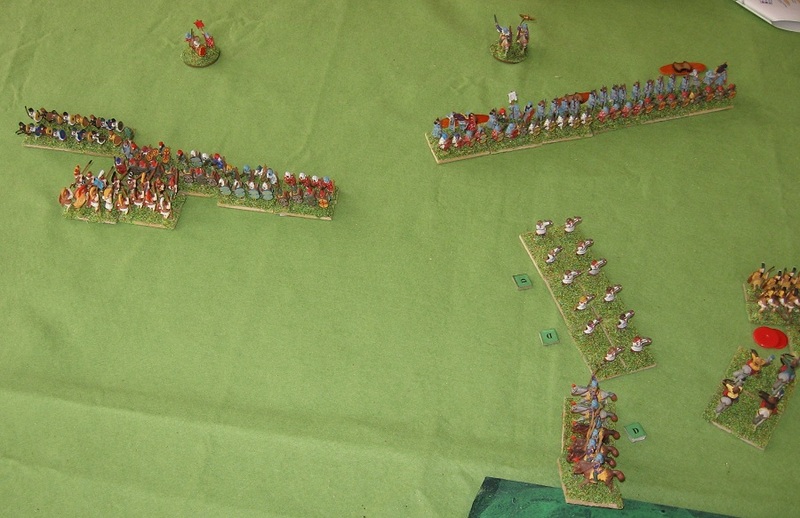 The final game was no more than a skirmish against a Seleucid which put all its eggs into a flank march that took all game to turn up, meanwhile packed itself in behind a wall of bronze which we could not dent. The presence of an IC meant our shooting never built into decisive collapses, and our reserve prefered to wait for the flankers rather than impale itself on a wall of undisrupted pikes. 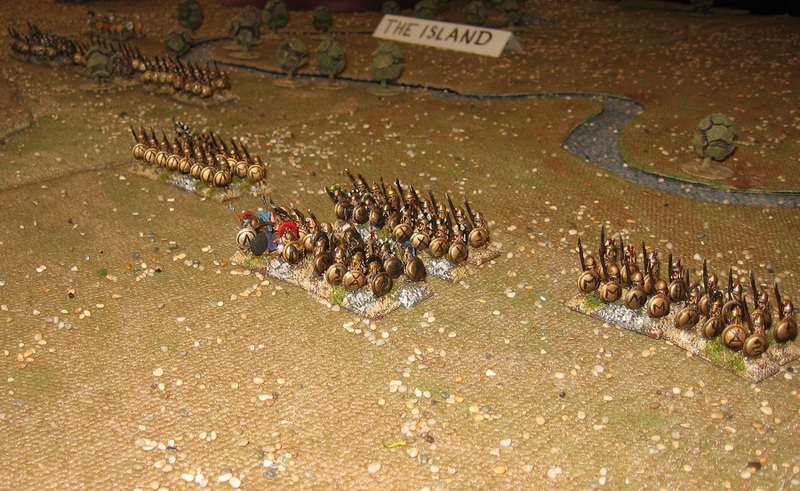 We took no casualties and in so far as there was a result it was decided by a unit of stragglers lost on the march. 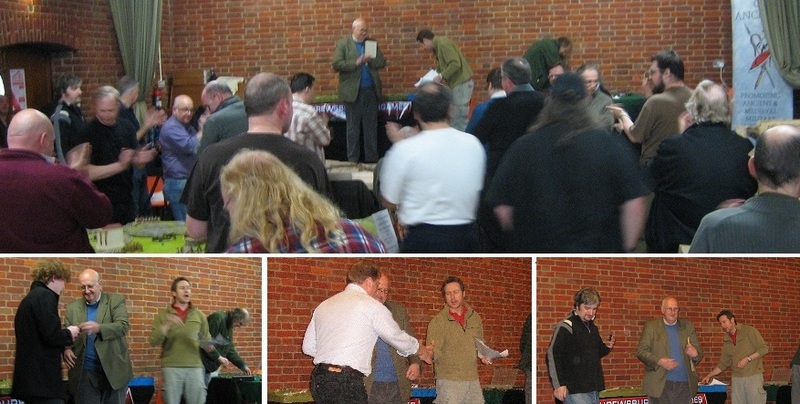 David Fairhurst presented the prizes. We had a small membership stand at the event and took some renewals - and, no Committee members being present, I was pleased thanked the organisers on behalf of the Society (as I would have done in former times). 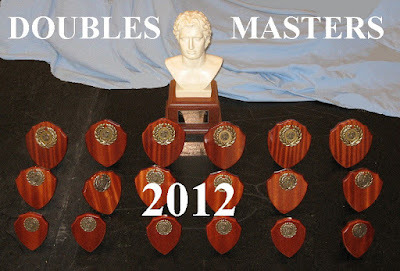 Society of Ancients Doubles Champions. There is talk of changes to the formula here - possibly pairing armies in the original Doubles way ... variations to the points or table arrangement etc. 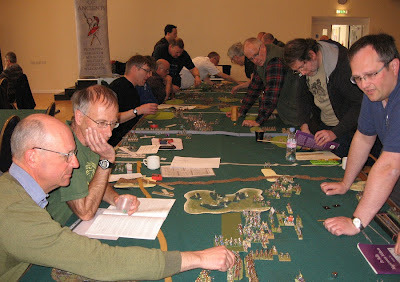 Hopefully, the event will become 'open' again (or at least inclusive, like say Burton or Usk), rather than the recent trend towards highly restrictive periods which may not be of interest to members and enthusiasts. Still, a lovely venue in a pretty town, good company plus two good games and a stalemate. 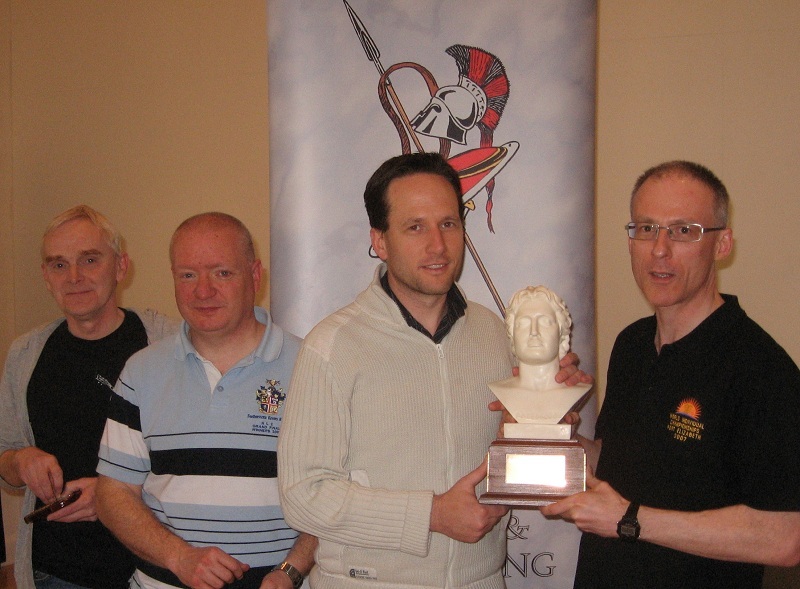 And the Alexander trophy goes to new winners. 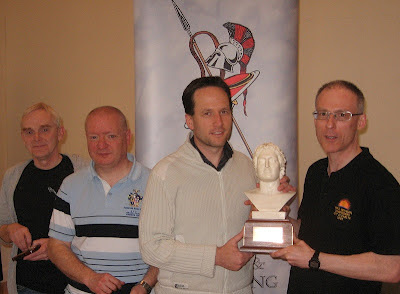 Full scores and finishing positions can be found on the BHGS website in due course. 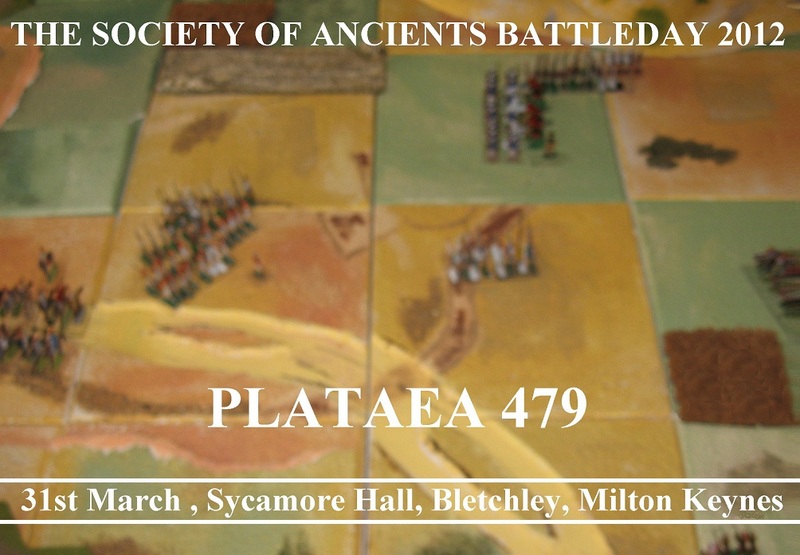 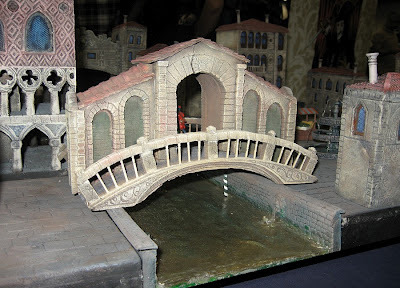 The Society of Ancients will be at Salute on saturday 21st April. 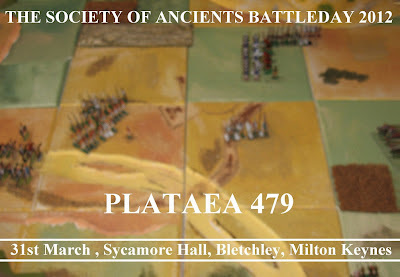 See you there, perhaps .. 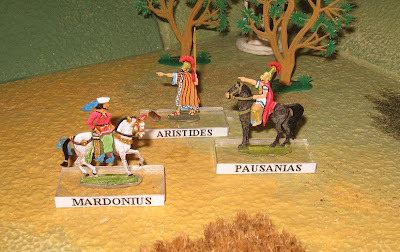 This year's BattleDay featured the epic clash between the Persian army of occupation under Mardonius and the Greek alliance forces laed by the Spartan Pausanias. 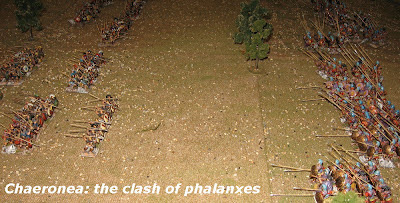 The day started with a comprehensive introductory guide to the battle and the sources by Philip Sabin and a quick note by myself on the nature of the sacrifices which immediately preceeded the battle. 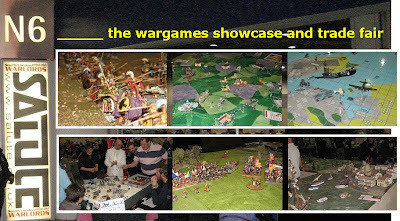 These will be available to Slingshot readers in due course together with views on the how the battle was fought under the variety of rules enthusiasts contributed to the event. 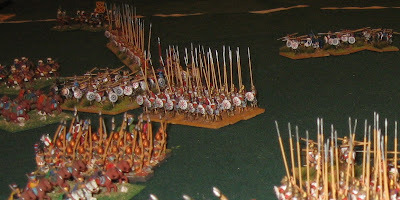 Lunchtime then accomodated a forum with Duncan Head on matters arising, weapons and equipment etc. 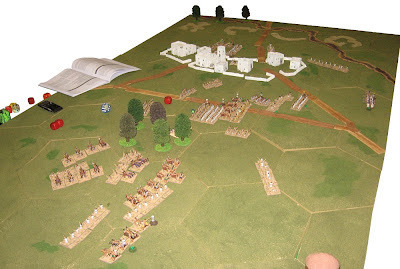 ... and more on sources and interpretation. 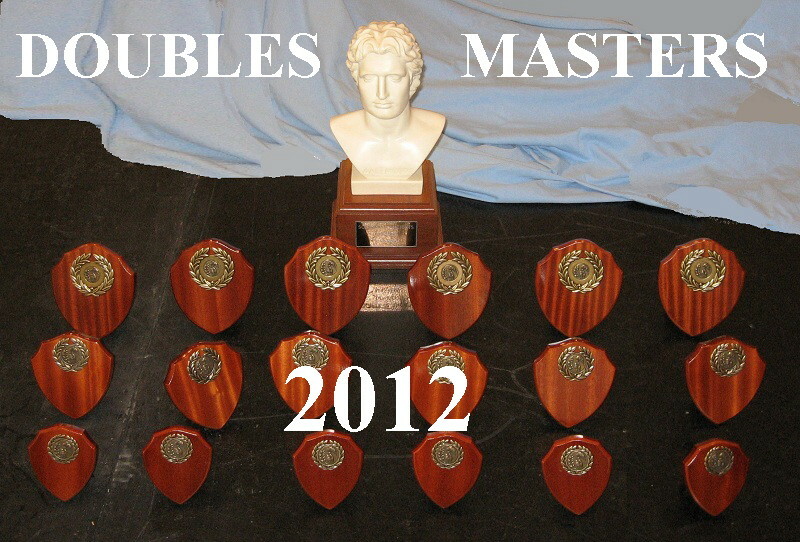 Plus awards for the notable deeds of commanders and players. Keep an eye out for an announcement of next year's battle. A wonderful and illuminating day out. 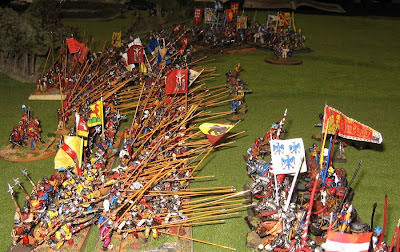 What wargames events should be.